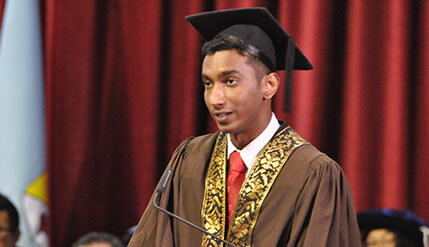 BANGI, 1 Nov 2014 – Surendra Ananth Anadaraju who received the Royal Education Award at the National University of Malaysia (UKM) 42nd Convocation here today attributes his success to having a crystal clear goal and working smart. The Law Faculty student said working smart means knowing what is required of you by the lecturers. “It helps if you know what your lecturer is looking for in an answer. There is no use writing a ten-page long answer when your lecturers prefer a shorter answer that contain substance,” said Surendra. The advantage of working smart is you don’t have to study all the time. This gives time for you to do other things. And he did use that time wisely. He got involved in Moot Court becoming the president of Moot and Debate Club of UKM. He had also represented the Asian Law Students Association (ALSA) as president to The European Law Students Conference. The eldest son of three siblings don’t always know what he wants to do in life but after struggling with the process of learning law he finally knows what he wanted to do which is to become a human rights lawyer to help people both locally and internationally. Surendra aspires to work with the United Nations on human rights issue at the international level but said Malaysia is his home and even if he had to work overseas, he will come back home eventually to serve the country. He attributed his success to the freedom that his parents gave him to discover his own career path. He said once you know what you want to do after you graduate things become much easier and clearer. He admits that the reason why someone studies law can change as they progress in their learning. During the first year everyone is idealistic wanting to uphold justice and help people. But by the third year some will be looking for the subjects to choose so they can make the most money. But his intention has not changed. In fact if he does not have to worry about earning a living he would spend his life in volunteer work helping people. Thus there has to be a trade-off. To help people you must be financially secure. So sometimes you might have to do things that you may not like to be able to finance yourself to do things that you are passionate about, Surendra said.